Building the mounting solution to fit your needs and the specifications of your vehicle can appear to be an intimidating task. What equipment fits in what vehicle? What if your fleet has a variety of vehicle types? 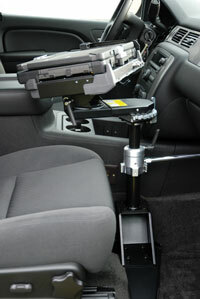 If a passenger is present in the vehicle, will the equipment you have still work? How do you keep occupants from potential harm in the event of an accident? What about airbag safety? These are questions that arise in every mobile computing project. Havis offers an assortment of products to get you mobile and makes it easy to choose a safe, space-conscious and ergonomically designed solution for your fleet. If you don't see the solution you need, please call the DSC at 866.975.5DSC or contact the DSC by email at info@theDSConline.com. For non-standard vehicles and upgraded vehicle solutions, the DSC leverages Havis' extensive product line to meet your needs. With a wide variety of parts to choose from, enhanced solutions require consultation with DSC representative to provide a complete and ideal solution. Please call the DSC at 866.975.5DSC or contact the DSC by email at info@theDSConline.com. For rugged needs that fall outside Havis' current product line and require customized equipment, the DSC can leverage Havis' highly skilled engineering team to build your solution. Engineered solutions require extensive consultation with DSC representatives so that a solution is designed to meet your needs. Please call the DSC at 866.975.5DSC or contact the DSC by email at info@theDSConline.com. 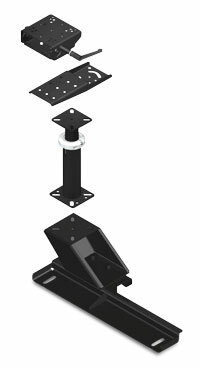 Don't see a mounting solution for your needs or have questions? Please call the DSC at 866.975.5DSC or contact the DSC by email at info@theDSConline.com. Copyright © 2010 Havis, Inc.